Welcome back if you’re a regular visitor, and if you’re new here because you’re following the blog hop party giveaway, then welcome for the first time. I’ll keep this short since I know most everybody is busy hopping from one exciting giveaway to the next, but I’d love it if you became a follower and stopped by on a regular basis. I’ve only been quilting for about a year, so I like to keep things real as I talk about the process of learning around here. Sometimes I have quilts turn out just the way I hoped, and sometimes, my seam ripper and I are the best of friends. This giveaway includes two fabrics. First, you’ll get a charm pack of Wren and Friends. I let myself thumb through the edges of the fabrics, and they are super adorable. Last time I got my hands on a charm pack, I used the Storytime Squares pattern at Made by Rae. The pattern is downloadable, and I know no quilter ever said, “Hm, I really don’t have any patterns on my dream list,” but just in case you need a pattern, there you go. Isn’t it such a simple but cute quilt? I think it would look adorable in the Wren and Friends fabric. The next fabric in the giveway is a 12 Days of Christmas panel. I picked it up because I love the bright, somewhat alternative take on Christmas colors with some teals and olive green thrown in the mix. I’m just going to give you a teaser photo; if you’re the giveaway winner, that will also give you an element of surprise (plus, I’ll ‘fess up and admit that it’s too tough to get a shot of the full panel in the messy, poorly lit dining room). Ok, so what do you have to do to win? You get one entry just for leaving a blog comment. You can comment about anything, but if you’re having writer’s block, I’d love to see a link to your favorite pre-cut friendly pattern. I’ve started my own Pinterest board of these patterns, but it’s just a baby board. I’d love to add more to it. If you’re a follower, you can get an extra entry. Leave a second comment telling me how you follow the blog. I sure hope you’ll at least stop back again in January when I join the Wake up to Kona Solids Blog Hop. Make sure you use the Rafflecopter form to confirm that you’ve left both comments because Rafflecopter gets to pick the winner. Here’s the technical scoop. This giveway is only open to US readers. I want to make sure that Christmas fabric gets to you in time to whip together a Christmas project. I’ll email the winner after the winner is randomly drawn, announce the winner in a blog post, and send an email (make sure you leave one if you’re a no-reply blogger). The giveaway will end on November 26th. And, once you’re done here, make sure you hop on over to the other giveaways in progress. Lots of them can be used with precuts. Thanks for the chance to win. I’m a follower with Bloglovin’. Thanks again. I follow via Bloglovin. Thank you for the chance to enter your giveaway. Fantastic giveaway! I’m tossing my name in the hat! I love charm packs! I’ve added your giveaway to my weekly link up. I follow on Bloglovin of course! Moda Bake Shop has tons of free patterns and you can search them based on the precut you have on the Bakery tab at the top! HELLO, check out Camille Roskelley’s site;her patterns are clear and easy to do! I am always stuck on what to do with a honey bun pre-cut. I know it works with any jelly roll pattern but then it ends up tiny! My last project done with precut 2.5″ strips was a pattern by Gudrun Erla of G.E. Designs. The pattern is “Strip to the Beach Bag” and is in her book Fast & Furious quilting as you go. I saw one another quilter had made and went right out and bought the book. I don’t sew with precuts enough to have tips…except that my favorites are the 2 1/2 inch strips. Wrens & Friends is one of my current favorite fabric lines, so cute! Thanks for the chance to win. Love the christmas fabric! I am a sucker for all Christmas fabric. The only pre-cuts I’ve used were charm packs and I made Schnibbles with them. Fun and easy patterns. I don’t have any precut patterns to add to your board, but I will check out what you have for inspiration. That Wren and Friends line has been calling out to me for some reason! It’s not my normal color range, but they are so rich and bold! thanks for the giveaway! Sorry I don’t buy precuts because I make my own in mins with the most wonderful rule in the world called the shape cut plus. If you have never seen it then there is a video on YouTube that will tell you everything you need to know about this great ruler! I have no tips, but that pack is adorable. Hi there. Thank you for visiting my blog. Great giveaway. Beautiful blanket. Moda Bake Shop has the best collection of pre-cut patterns but I just like to play with the inspiration of the fabric. I just find the airplane fabric fantabulous!! I love charm packs for the variety of fabrics. Great giveaway. I have been following via bloglovin. I don’t really have any favorite pattern with pre-cuts, I usually cut all my fabrics. I dont have a favorite pattern but On Craftsy Camille has some great patterns for precuts. I get lots of ideas from Moda Bake Shop and Fave Quilts. They use lots of precuts. Thanks. I like Robin’s Rainbow by Happy Stash Quilts that uses a jelly roll. I do love pre-cuts. Cozy Quilts (www.cozyquilts.com) has a ton of patterns using pre-cuts. I also think The Fat Quarter Shop recently came out with pre-cut patterns too and some are free. I am also only been quilting for about a year, so I love the internet.. You can find almost anything you are looking for. Thank you for the nice give away. Thanks for a great giveaway. I’ve only used precuts recently for the first time and loved it. Thanks for having the giveaway. I really have a mind that has a lot of trouble following a pattern so I kind of just create as I go. I really enjoyed your pinterest board so much so that I may give a pattern another try. Great giveaway. I love Schnibbles patterns for charm packs. I used charm packs for making dresden plates before. i’ve really only made one quilt top using precuts (other than FQs) so far. Most of my charms and layer cakes are sitting pretty in my stash! I have created a lot of free block patterns for the Block Lotto. You can find them all on the Block Patterns page of my blog, Sophie Junction. Many of them are suitable for using pre-cuts, though not specifically designed for them. I’m following you with bloglovin. I love Pinterest. Will check your boards out today. Love your twelve days quilt, wish I could see the entire thing. Following via bloglovin and pinterest. I follow via Bloglovin. Happy to have found a fellow Pennsylvanian! Sorry, but I don’t have any tips. Thank you so much for your giveaway. Moda Bake Shop has lots of patterns that are pre-cut specific. If you click on the “Bakery” tab, you can choose patterns for jelly rolls, charm packs or whichever precut you like. Lots of great ideas there! I have been very busy making Christmas gifts for my entire family so could sure use some more fabric. The website favequilts.com has many free patterns suitable for pre-cuts. I like Missouri Quilt Star for precut patterns. The latest addition to my want to do list is the Jacob’s Ladder Remix pattern. Thanks for the chance at your giveaway. Charms are so versatile. I get my inspiration for blogs. I haven’t used precuts that much as I usually buy yardage since I like to wash my fabric first. I don’t have a favorite but here’s an easy one. There’s lots of great stuff there! I am also new to quilting, 🙂 I already have a mile long list of quilts I want to make. Happy Thanksgiving and thanks for the chance to win. I have made some quilts with precuts before. It kind of spoils you…lol. I have just found these free fat quarter quilts on craftsy! Thank you for the lovely giveaway! I follow now w/ Bloglovn’ Thanks again! Those fabrics are awesome—would love to have that little packet to play with. 🙂 And I really like that quilt pattern. I have to go check it out. I just found your blog through this Hop—aren’t these hops wonderful for meeting new friends? And I’m now following you by Bloglovin. Thanks for posting a charm pack friendly idea to go with your giveaway. Following via Bloglovin and Pinterest, thanks for the chance to win great prizes. I like the 12 Days of Christmas panel. Fun price! Thanks for the chance to win! I love charms and especially this pack your giving away!!! Moda bake shop has some really cute patterns. I love making pillows with precuts…charm squares. I love that all the squares are perfect! Thanks for the chance to win. I love turning pre-cuts into tumbler quilts/runners. Love the fabrics. Can always use more and find patterns to go with. thanks for the giveaway. have add to favorites. Checked out pinterest. I love precuts.. so easy to use esp jelly rolls for postage stamp quilts. Here’s a pattern for a jelly roll: http://www.fatquartershop.com/free-quilt-pattern-jelly-roll-jam-free-quilt-pattern There are lots of other free patterns at the Fat Quarter Shop and they have YouTube videos as well. I’m already a bloglovin follower! Great giveaway and stop by my blog, I have lots of ideas for pre-cuts!! I follow you too. I’m glad to have met you, courtesy of the Blog Hop. I’ve added you to my Bloglovin’ list. Now I’m going to go back to your previous posts. I love precuts of all sizes.. makes my sewing much more accurate. I love precuts and that panel is so darn cute! I’ve been looking online at the Wren & Friends fabric. Thanks for an opportunity to enter the giveaway! I follow your blog. I don’t have a favorite precut pattern but the Moda Bake Shop has plenty to choose from. Thanks for participating in the blog hop. I like going to the Moda Bake Shop for great patterns. Just google Moda Bake Shop and it should bring the website up. Thanks for the great giveaway. I’m a new follower via Bloglovin. As a new quilter I don’t really have any pre cut tips for you other than I find Moda Bake Shop a great source of inspiration. Thank you for sharing! I like your blog – a lot of good ideas! I used a charm pack of Pure by Sweetwater to make a Yellow Brick Road quilt. It was easy, and so charm pack friendly. I have found many lovely ideas at the Moda Bake Shop. If you’ve never been there, you should go. It is all about precut patterns. I love the pattern that you used for the quilt you showed! Very pretty! I like the Strip Therapy Books by Brenda Henning. I have a few of them but they are still on my to do list. 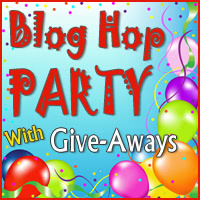 this is my first blog hop party…I think I want to start a blog! I usually end up making tote bags from charm packs. I don’t use many precuts but I’m enjoying making the St. louis 16 patch block from FQs right now. Thanks for the giveaway and you have a very nice blog, keep it up!! Love to hop around to all these blogs and appreciated everyones efforts. Thanks for the giveaway. Thanks for the chance to win. I haven’t used any precuts yet! I love creating with precuts – my favorite thing to do is pair them up with a background fabric and start making HSTs… if you search for HSTs on Pinterest you will find all kinds of layouts for inspiration! Thanks for your giveaway! I’m following you via Feedly! Thanks for a chance to win the fabric! I don’t usually do anything with precursor except make baby blankets, so no help from me, sorry. But thanks! Following on bloglovin…do you have FB? Too be honest, I love just sewing the pieces together in rows! Never makes a bad quilt and easy. MODA’s jelly roll jam and layer cake lemonade looked pretty cute too. If I win, I would love the Wrens and Friends pack. I now follow through Bloglovin. What a lovely blog! Hope you get some cute pattern ideas. What a great blog – glad I found it because I am a beginner, too. I don’t have any quilt pre-cut patterns but did create 2 different Charm Totes by Penny Sturges “Quilts Illustrated” Both came out nicely. What a great photographer you are — you showed us just enough of the panel to pique our interest. As for picking a pre-cut pattern, impossible — too many great patterns and too little time! I love charms squares but don’t really have a link to a pattern. Sorry. But thanks for a great giveaway. We like to design our own in EQ7. Thanks for chance to win. I’ve never made a quilt from precuts so I’ll be watching the links you get for ideas . I love charm packs. Thanks for letting us visit. I’m a new follower! Thanks, again. I just started following you! I love the charms too! I do really like that pattern, thanks for the great giveaway. I love the Storytime Squares pattern! Great giveaway!